Walter Stuart, Regional Coordinator for the Global Fellowship shares more about the impact Hurricane Irma and Maria had on the Caribbean and specifically about the BB presence in the region. The month of September will be forever etched in the minds of those in the Caribbean, as one of the most challenging experiences ever as they recall the damage, mayhem, discomfort and inconvenience caused by Hurricane Irma and Hurricane Maria. 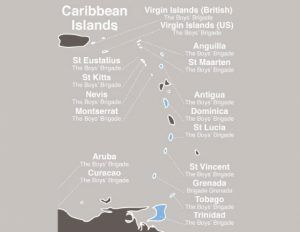 Hurricane Irma in particular which devastated Anguilla, British Virgin Islands (Tortola), Saint Maarten, Saint Martin and other Leeward islands, has been referred to as the strongest hurricane to hit the Atlantic and unofficially as the fourth costliest hurricane on record. This category 5 Hurricane with a wind speed of up to 295 km/h caused massive damage and loss to several of our BB families and counterparts with whom we just recently celebrated at our 125th Anniversary Camp in Antigua (July 2017). Hurricane Irma has caused widespread decimation to the island and this will have a significant impact on its tourism industry, to which locals depend for direct employment or to feed small businesses. Since the hurricane, they have been left with no electricity and running water and chronic fuel shortages have further hampered mobility. Telephone communications were down and there was limited access to the badly-hit port. Thankfully these services are slowly starting to be restored. Schools are gradually being reopened some on a part time/shift basis. All three churches associated with The Boys’ Brigade on the island sustained major damage to the roofs and while the 1st and 4th Anguilla BB Companies have resumed meeting, the 2nd Anguilla is looking to restart shortly. The island of Tortola is considered the territory’s largest and this island suffered an extraordinary level of destruction. Some of the homes of the members who attended the International Camp just a few months ago have been severely damaged. Gradually, communication is being restored and to date many residents are still dependent on generators while others resort to batteries and candles which are in short supply. Looting, which was an unfortunate feature immediately after the hurricane is now over. Some schools are still closed and this has caused some parents to send their children abroad to continue their educational pursuits. It is uncertain how this would impact and affect BB on the island. In the meantime, efforts are being made to have BB regrouped and reactivated. Dutch officials have reported that up to 70% of the island’s houses were badly damaged or destroyed by the hurricane. The airport which was severely damaged was closed for several days and several businesses were forced to close due to the devastation. Some of the main hotels are still closed, but are making tremendous strides towards reopening for the tourist season. Several parents have opted to send their children overseas for schooling as the reopening of schools was delayed for quite a while. Thankfully, BB for the one Company on the island restarted on October 5th. Upon the passage of Hurricane Irma, this island was unreachable, the hurricane left a trail of wreckage with damage to almost every building on the island. Looting and lawlessness ensued on the island immediately after the disaster with gun-toting gangs marauding through the streets and robbing people and businesses. This situation is now under control as police and troops have brought order to those acts of lawlessness. Water and electricity are still not available in several areas. The only BB Company has lost some of its members to Guadeloupe as they have relocated there to continue their schooling since some schools on the island still remain closed. The Ebenezer Methodist Church from where the only BB Company operates suffered severe loss and still remains non-functional. As a result, BB has not yet restarted. Capt. Marie Holaman in her most recent message has indicated that while the situation may appear hopeless, the people of St Martin are thankful to be alive and are requesting prayers for quick restoration.